Let’s Look At Fall Colors before we spotlight some of the collections in more detail. So what colors are big this season? Bronze? Navy? Here are a few we are hot on. Look for more extensive features on some of the fall color collections. UVSunSENSE Wristband 7 Pack ($10 @ amazon.com). CLINIQUE Colour Surge Eye Shadow Quad in Bamboo Pink ($25 @ clinique.com). PRESCRIPTIVES Calyx Sheer Exhilaration ($38.50/1.7oz @ amazon.com). ISADORA Crystal Gloss Stick in Coral Rose ($12 @ amazon.com). THE BALM Mary-Lou Manizer ($22 @ dermstore.com). ORLY Nail Lacquer in Teeny Bikini ($7.50 @ jcpenney.com) from the Tiki Time Collection. T!NTALIZE The Premier Concealer for Feet ($15/7 packettes @ tintalize.com). PRESCRIPTIVES Exhilarating Lipcolor in Papaya ($17.50 @ prescriptives.com) from the Exhilerating Summer Collection. REDKEN Sparkling Shield ($11/5oz @ redken.com for salons) from the Color Extend Collection. I consider greens, as in mossy greens, a very neutral color. They are so earthy, warm and natural that they could take the place of nudes in most cases. 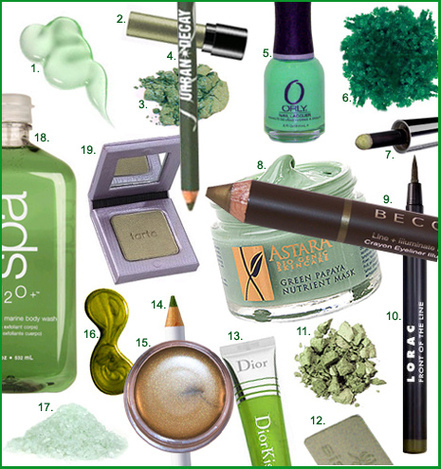 Olive, tarragon, and the creatively named products below, all make up our 2nd Fall Color Pick, Mossy Green.